Hello and good morning in the pre-dawn hours. : ) I am wondering how things went for you with the forgiveness challenge. Were you able to do the exercises? How did/does it feel? Do you think you’ll be able to get to the point of forgiveness? I hope so. When I came to sobriety, I did so having just read Conversations With God. This was a very powerful book for me; the effect on me was astounding. I had begun to believe that God was everywhere around me, in everything and everybody. So, when I entered sobriety, I thought it was God urging me to do so. I now know this was the case, but about 3-4 years into sobriety, I began to have difficulty with God. I was working through my childhood issues, dealing with the anger and rage, the confusion and hurt, the wounds I was left with from my childhood. I began to trust God only so far, and then I felt I needed to take over, I needed to watch my back. I had reverted to a survival mode, one which was familiar and necessary from childhood days. Right about the time that I was in deep despair, my sponsor suggested I begin to notice the things in my life that were going well, the good things that were occurring that I did not plan nor force to happen. So I did. I began to notice these things. What I soon discovered was that wonderful things that were happening, small, little things that I did not design or orchestrate. My sponsor said this was my higher power working in my life. Ahhhh, I thought to myself. So, this is the higher power. I began to trust that I was being cared for, watched over. Slowly, I eased the need to watch my back, and began to believe that it was being watched by my higher power. Today, I believe there is a higher power at work in my life. I see evidence of it every minute of every day in the small things, the things that fall into place as a result of me having taken action. Opportunities arise, people are there to help me… it all just falls together like a beautifully choreographed dance. As we move forward in our journey into sobriety and my book Opening the Gates of the Heart: A Journey of Healing, we come to the topic of trust. Remember, we are in search of ways to get and stay sober, and to find peace. Of paramount importance in the journey to and through sobriety, or simply through life, is a trust in Source, or the power of the Universe, or God, or whatever you call that force in the world which guides you, offers you solace, offers you opportunities.This force will take a front seat in your journey, and it will become your companion, your confidant. This is necessary because when you have difficulty, and want to drink, you can call upon this Source to help you, and it will! It’s the most amazing thing! I came into sobriety just having read the book “Conversations With God” by Neale Donald Walsch, and I was smitten with the idea of God. I believed He was everywhere, in everyone, in me. This became very important to me when the feelings of my emotions began to surface without alcohol or drugs to numb them, and it was this belief to which I turned to help keep me sober, to lessen the emotional pain I experienced. I got relief, and I was able to keep from drinking, so I kept believing. But I lost trust as the hurts and pains of my old wounds surfaced in years two and three of sobriety, leading me to feel that God could not be trusted, that I still had to “watch my back.” This lack of trust went on for some time. Even so, some force graciously helped me stay sober, and I thanked that force daily. At one point, my spiritual advisor suggested I notice every time something good happened in my life that I had not arranged, had not orchestrated. Something that was for my better good, or that fulfilled a piece of my dream. I did what was suggested and started noticing. Sure enough, little things kept happening that furthered my dreams to become a photographer. Opportunities began to present themselves that I knew nothing about until they showed up. I began to make gains and strides in my healing work. I finally made the choice to believe there was some guiding force that was grander than me, that would guide me through the maze of life -my emotions, my dreams, my challenges. That force comes to me in small voices in my head, telling me a certain course of action to take, being my conscience, guiding me when I listen to it. The point is, you need to make the choice to believe in a force greater than yourself to help you stay sober. You do not need to do this alone any more. It is safe to ask for help. There are people waiting for you with out-stretched arms, ones who have done it before and are guiding you. These people show up in your life at just the right time, as if sent by Source. It is my deepest hope to be considered by you as one of those people with out-stretched arms, guiding you through the process I took to stay sober and find peace. I share my story here to be of use to those of you still suffering, whether with an alcohol or drug problem or just plain emotional turmoil not complicated with substance abuse. May you find something in my words to further your journey in a positive manner. Today, we are dealing with doubt. Specifically for me, it was the doubt of a power greater than myself, doubt in the existence of God. Yesterday, we talked about belief in a higher power when we talked about trust. But our discussion can relate to doubt of anything. For example, perhaps you doubt that sobriety is the route for you to take. You are the only one that can make that decision. If you doubt that you need to quit drinking, look at how it’s affecting your life. Maybe you are functional, and still able to work, able to function in life. If that’s the case, then look at your private life for signs that alcohol is not working for you and, in fact, is causing strife in personal relationships or in your emotional life. It is tempting to say, “That relationship is bad because they did this or that, they are this or that…” If that’s your excuse, it’s time to fetch yourself up and look at your own behavior. Do you drink and then have experiences which lead to another doing this or that? Perhaps they are reacting to you in your drinking mode. Look at it honestly. We’ll discuss honesty in more detail tomorrow. Meanwhile, if you have doubts that sobriety is for you, let me just say that most of us who have gotten sober were so beaten down that sobriety was the only answer. In other words, those of us who have gotten sober had no doubt that sobriety was needed because we’d lost everything. Perhaps, if you look at it closely, you can elect to get sober without having to lose everything in your life. When doubt arises, allow it to become conscious, and look at it as objectively as possible. Realize that it is normal human behavior. But keep your eye on the light beyond the gate, where the stones are bathed in light. Look at the part of your heart and soul where shadows lurk. Make the determination that you don’t wish to live in the shadows, and pass through to the side of light. Perhaps, you notice your shadows in your heart, your spirit, your soul. There is a way out of that. It’s called sobriety. After a few years of being sober, I was able to dispel the shadows in my heart, spirit and soul because I had healed emotionally. That healing was a direct result of becoming and staying sober. You, too, can heal your emotional wounds, your personal relationships, and live in the light. The choice is yours. I wish you well in that decision. The power you gain by trusting in a force greater than yourself is incredible. Part of being able to move forward with awareness and discovering yourself involves being able to trust in something bigger than you are. For me, I had no choice but to trust in something bigger and more powerful than me if I wanted to get and remain sober. After all, I had tried and tried to quit, but wasn’t able to until I let go, surrendered, and began to trust that a greater power could help me. That was my story; yours may be quite different and have nothing what-so-ever to do with drinking. The bottom line is, no matter what we try to do in our lives, there is a power greater than ourselves. Call it the Power of the Universe, the Powers that Be, Great Spirit, God, Buddha… the name doesn’t matter, it is the concept, the act of trusting a greater power. We cannot see this power; it is intangible. And, yet, if you believe it exists, it can give you courage and strength to move forward and do things you are not able to do on your own. Are you trying to love yourself, to have faith in yourself, to let your light shine? All of these things are achievable when you believe that there is something bigger than you, guiding you. How does that work? I have no idea, yet, I have found it works very well. If you give up trying to accomplish things using your own will power, and focus on a power greater than yourself, almost effortlessly, things you have tried to accomplish begin to happen. You must take action, however. It is not a matter of sitting around and expecting that this power will do things for you or drag you from one good thing to the next. Oh, no. It is more that opportunities begin to be presented to you, and you follow up and take action on them. You determine what that shows up in your life will be beneficial for you, and then you follow up. When you do this, amazing things begin to occur. All it takes is faith in that power greater than you. It is amazing the power you gain by trusting in that force, believing that it can accomplish what you are unable to do using your own will power. What are the ways in which you trust in that force? How does it work for you? I invite you to leave me a comment and let others see what works for you and the power you gain by trusting. A way is presented. The gate stands open ever-so-far, beckoning. The path looks inviting, enveloping. Our eyes travel to the top of the path; we cannot see where it leads, cannot see what is up there. Hesitation occurs. And still, a way is presented, steadfastly. Do you follow the path when you don’t know where it will lead, when you can’t see what is ahead? 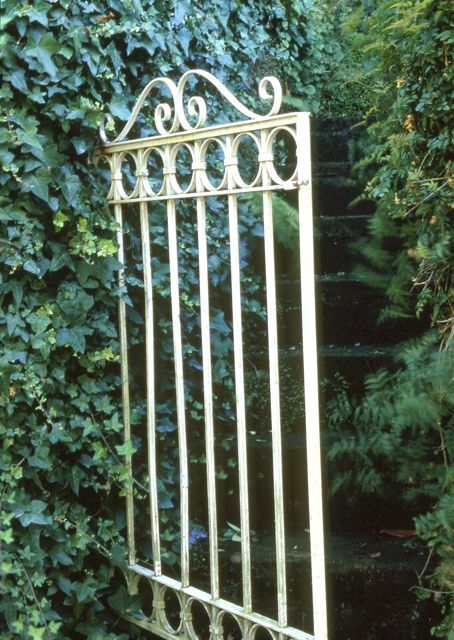 Do you trust your instincts, accept the invitation, open the gate which stands ajar and walk through? Perhaps your belief in the Divine and your trust in that entity enables you to travel and open yourself to the unknown. Maybe your belief permits you to trust others and yourself. Or, perhaps, you allow fear to stand in the way, thwarting your attempts to traverse the path, to open up to others, to a higher power, to yourself. When you have opened yourself to any of these, have you been disappointed, sorrowful, hurt, thus rendering you incapable to trust the next time? The second example was me for most of my life. I was constantly trying to trust, only to continually experience disappointment, hurt and sorrow. With a higher power, I could trust only so far and then I felt I needed to watch my back, to take charge. During my journey in sobriety, it was suggested that I notice each time when the forces of the Universe were acting in my best interest, when things turned out better than I had planned or imagined. So, I became willing to take this advice and began to gain trust that something was taking care of me because situations did, indeed, turn out better than I’d thought could happen. Over time, my trust in the forces of the Universe, a higher power, the Divine, God, or whatever you choose to call that force, grew slowly. Trust has evolved. As far as trusting others, I have learned I need to lower my expectations. Then, I am pleasantly surprised when something happens. I have difficulty with this, so have much opportunity for practice. Trusting myself has become easier; yet, it was difficult for a long period. I began to notice the times when my intuition was” right on” in a given situation. That gave me courage to trust myself in the next instance. Gradually, I lowered the expectations I hold for myself and learned to forgive myself when I was not trusting. I am getting much better at this. Again, it’s practice.